Disclaimer: This website is independent of digital brokers featured on it. This website does not provide investment services or personal recommendations to clients to trade digital options. Information on IQ Option.org.za should not be seen as a recommendation to trade digital options or a be considered as investment advice. 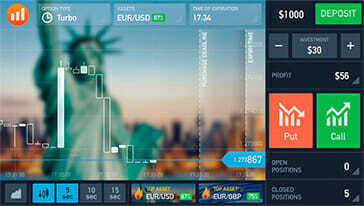 IQ Option.org.za is not licensed nor authorized to provide advice on investing and related matters. The potential client should not engage in any investment directly or indirectly in financial instruments unless (s)he knows and fully understands the risks involved for each of the financial instruments promoted in the website. In case the potential client does not understand the risks involved, he/she should seek advice or consultation from an independent advisor. If the potential client still does not understand the risks involved in trading in any financial instruments, he/she should not trade at all. Potential clients without sufficient knowledge should seek individual advice from an authorized source. In accordance with FTC guidelines, IQ Option.org.za has financial relationships with some of the products and services mention on this website, and IQ Option.org.za may be compensated if consumers choose to click these links in our content and ultimately sign up for them. digital options trading entails significant risks and there is a chance that potential clients lose all of their invested money.